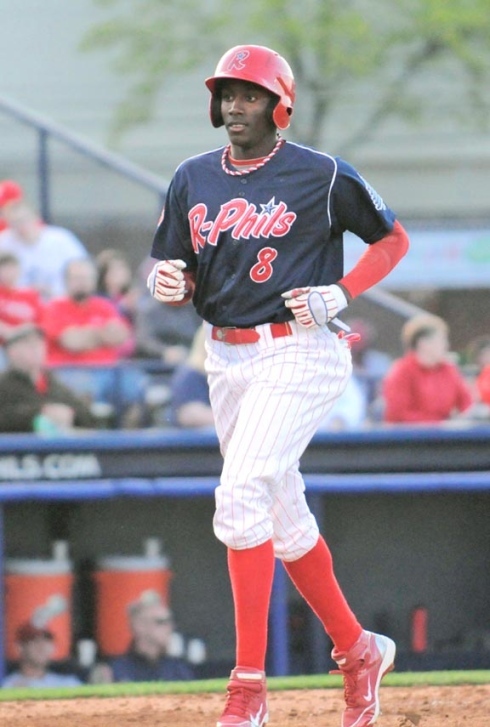 Season in Review: For one of the top prospects in the Phillies farm system, 2012 didn’t quite measure up to Jiwan James’ past seasons in the minor leagues. First off, James’ average was the lowest that it has been at any point during his time in the Phillies organization. The Florida native hit a mere .249 in 111 games for the Reading Phillies and only posted a .291 on-base percentage. The most eye-popping statistic was the drop-off in stolen bases for James. He went from stealing 31 bases with Clearwater in 2011 to only swiping 8 bags in 2012 with Reading. One constant was the fact that James was still being thrown out on almost half of his stolen base attempts. James was caught stealing 16 times in 2011 and 8 times this past season. James did have a decent season as far as triples were concerned. The Reading center-fielder finished 13th in the Eastern League in triples with 5 but was tied with six other players including Orioles third baseman Manny Machado. Teammate Cesar Hernandez led the league with 11. James is a phenomenal athlete and is currently deemed the best athlete in the Phillies farm system. He projects as a top-of-the-lineup player with tremendous speed and solid fielding skills. If James can improve his on-base percentage in 2013, he could move up to Lehigh Valley and ultimately be on the major league club in a few years.